A man and a woman in a garden. She has stories for him; he unpicks them. Stories about the origins of language and why people don't understand each other. She helps him explore a story he needs to tell - at first rather awkwardly. Gradually more and more complicit. They talk of Nimrod and neurons, of the babble of Babel, of poetry and the prefrontal cortex. They share a history that both binds them together and holds them apart. But do the stories they tell and the arguments they provoke draw them any closer? Or are they a way to avoid talking about the things that really matter? Time is running out. "Stripped right back – and in that simplicity managing to pack philosophy and science, myth and magic, laughter and heartbreak into a riveting 75 minutes – the strength of this piece comes from the union of intelligent writing and the word-perfect power of the performances." "Genuinely moving, audacious in its simplicity, a special experience. Theatre makers with a full mastery of their craft." "Stories make the heart bigger"
I could fill this review of multi story theatre’s ‘I Don’t Know What You’re Talking About’ with wonderful quotes from outstanding writers about why we tell stories. Try Philip Pullman, or Neil Gaiman. If I did that, however, there would be no room to sing the praises of actors Gill Nathanson & Bill Buffery. They describe the play as a work in progress. I have not been witness to the journey, but judging by tonight’s performance at Exeter’s Bike Shed Theatre, I feel they have arrived. Set, costumes, lighting and sound have an almost austere simplicity which allows the glorious words to blaze and dance, whisper and creep; fireflies in the darkness; weasels in the woods. A man and woman in a garden talk of ancient stories about the origins of language. They are awkward; at odds. He withholds; she talks much but says little. Somehow they hang in there, and, tentatively at first, begin to tell a story he needs to tell about the biblical account of Nimrod and the building of the Tower of Babel. She inspires and obstructs him. He supports and undermines her. Words trip them up and divide them, but suddenly he gives; she gathers; and the words fly, confident, inspiring, vivid. The rhythms and tensions of their co-operation and cross-purposes reflect an unspoken history - a dance of love, desire and separation eloquently told by the words not said. There are other things that are not discussed, and the writing is particularly delicate and sensitive when communication crumbles. There is bewilderment when he uses the language of science and mathematics to quantify life and love whereas she experiences the world through emotion and contact. There is no cheap male/female stereotyping here, however. He does not have a monopoly on numbers; she does not corner the market in feelings. There are moments of wonder when, together, both soar, sublime. The Tarot card, The Lovers, reminds us of what is possible when we unite and seem to fly. To counter, The Devil of the Aquarian pack shows the lovers bitterly estranged, no longer in harmony. Shooting stars fall to earth. ‘I Don’t Know What You’re Talking About’ is fiercely intelligent. There are no wasted words. This is work of the highest quality, with a script that fizzes and crackles with wit and wisdom. Witnessing a masterful performance ensures an inward journey that continues long after the applause has stopped. We review our own journeys and relationships, realising we use words to reveal, and to conceal. Stories connect and divide us. We see events through the prisms that help our lives feel meaningful and solid. The scientist and poet are not just being difficult when they find themselves at loggerheads. I cannot resist quoting Joan Didion. In a sunny garden, enveloped by birdsong, Bill and Gill talk about stories. They have a shared past – possibly as colleagues, or teacher and student, or perhaps more – that hovers at the edges of their interactions, hinting at something unspoken, unresolved, unrequited. At Bill’s request, Gill is visiting and has brought tales about the origins of language, about miscommunication and misunderstanding. As they pass the threads of myth and parable back and forth, collaborating and disagreeing, encouraging and correcting, the pattern of their own entwined narrative is revealed, and we, too, are pulled inside this subtly moving paean to the power of story. They begin at the beginning, with flood myths from around the world, and as Gill takes tentative steps into the telling – at times deferring to Bill, occasionally challenging his interruptions – we glimpse the structure of their relationship in all its give and take, surge and retreat. While Gill balks at the ease with which Bill claims ownership of the most ancient stories, by amending details and altering characters, she also questions the intrinsic patriarchal slant – where are the tales with women at their centre, shaped by women’s experiences? But Bill, who is increasingly infirm, has a specific story he wants – needs – to tell: Nimrod and the Tower of Babel. In a way that reflects the power balance in their own relationship, Bill takes control of the narrative; when he is intermittently gripped by seizures, during which he disappears from the moment, as if dropping out of the present, Gill steps in to support him, and they create the story together. Do stories reveal the truth or conceal it? How much of truth is true? Are we all talking the same language or different ones? 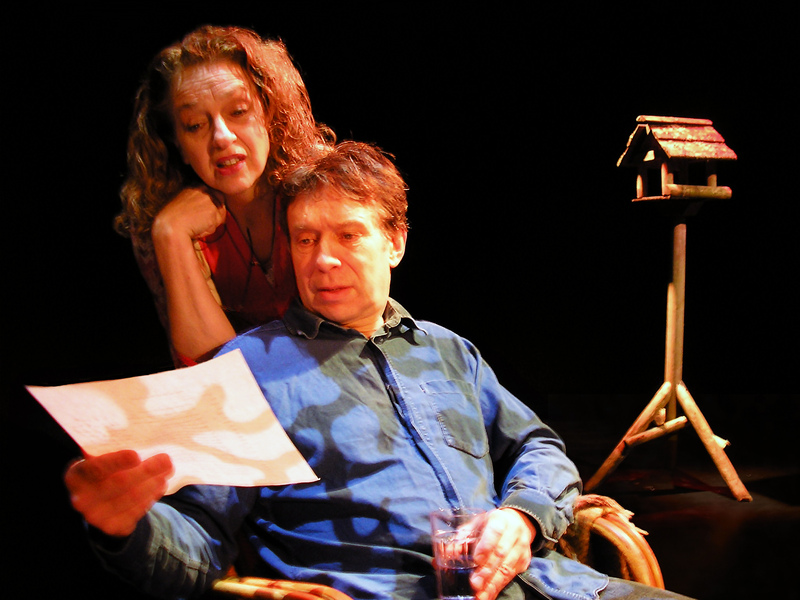 Almost Heaven was a deep, rich philosophical play about a couple exploring their enigmatic relationship by discussing the origins of language. A man and a woman meet in a garden to tell each other stories, stories about stories, stories about language and communication. Biblical stories which go back to the very dawn of communication, the Garden of Eden, and culminate in the linguistic chaos of the Tower of Babel. Do the stories they tell enlighten or confuse? Do we know more or do we know less? We don’t know who the couple are but we immediately detect a complex back-story which slowly, but incompletely, unfolds. Their uneasy initial meeting implies a failed marriage and separation, their own inability to communicate compensated for by them telling each other stories about communication. 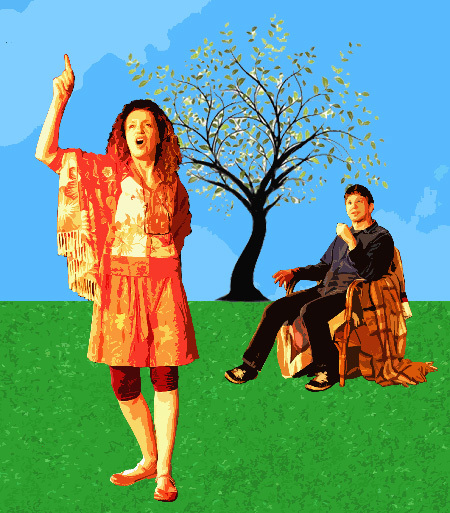 Almost Heaven was powerful stuff created by Bill Buffery and Gill Nathanson which explored relationships and how we communicate within them and even the value and efficacy of language itself. This was good, authoritative, thought provoking theatre with two beautifully measured and sensitive performances which would have graced any stage and for which I can only offer the highest praise. My only criticism was that visually it was disappointing. I appreciate that they perform in all types of spaces and have to be flexible but I think they would have been better served by a less cluttered, perhaps more stylised, approach. 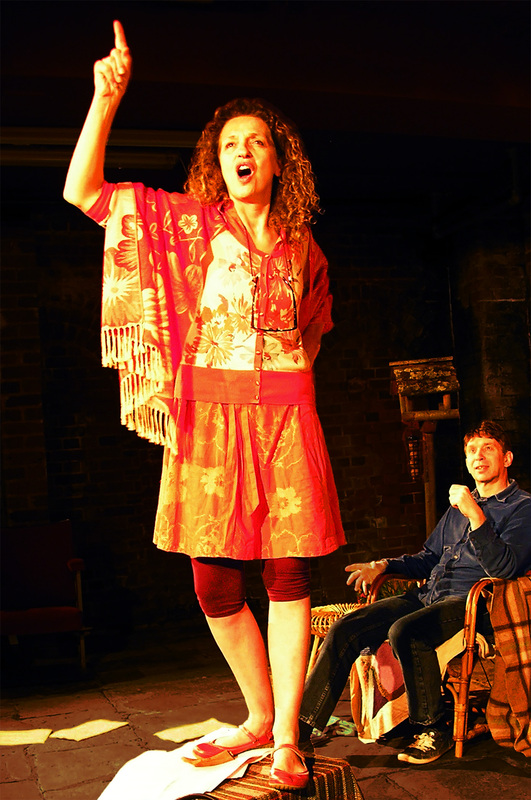 But otherwise the MultiStory Theatre Company’s Almost Heaven was a little gem of a play skilfully performed by its creators. It is a pity they were only performing in the Everyman Studio on one day. I’m sure when word got round more people would have been keen to see it. "Thanks to you both. It was an absolutely brilliant evening which will live long in the memory of everyone who was there." "It was beautiful, touching, totally absorbing and I loved the way their relationship although not explicitly explained, underpinned all their storymaking. This is the kind of theatre I love." "I was impacted hugely. I was thinking if I were to create a 'word cloud' for my experience it would include education, irritation, grief, intimacy, exhaustion, spirituality, humanity, connection, separation and many others. All of these relate solely to the content and how it affected me, not the performance! Indeed I must mention some uncomfortably familiar expressions and postures adopted by Gill that I have been on the other side of, that really captured something of the frustration and helplessness around the longing for connection that I have seen in relationships. I enjoyed the informative side of the story telling, and became irritated that these characters were using such a rich exchange to avoid a real exchange (whilst obviously illuminating it at the same time). I don't think I've ever wanted to scream at characters so much, and I'm quite relieved I contained myself. I also shed genuine tears as the true situation of Bill's character emerged (I admit to being a bit low on reserves and hence easy to move) but after all that shallow avoidance it was a moving experience. So well done for energising that. I did want to stop you several times, through trying to piece together the meaning of all the stories in the context of their relationship as they proceeded. I felt there were so many layers there that could be explored and I was immersed in that but something else was already happening on the stage. That's not a judgement of the pace, but more a celebration of what a rich tapestry of meaning was being presented. And that's my main endorsement of the play. It was more, to me, than simply using stories about language to outline a couple's experience with communication. I felt it brought us into the whole realm of all that is complex and destructive in the world right now - people who are essentially the same, longing to be connected and love each other, but unable to do so because their language, be that the words they learned to speak with, or the phenomenology that has molded their view of the world, is misunderstood by 'the other' resulting in so much conflict. And yet, stripped back to nothing but the living 'shell' the undeniable spark of life remains in us all and we can all relate to it. It spoke to me at a deeply spiritual level and invited me to think more about my own place in relationship to others. I believe Longfellow wrote 'If we could read the secret history of our enemies we should find in each man’s life sorrow and suffering enough to disarm all hostility.'" "I saw you at the Reading Fringe on Saturday afternoon and although we had a hug (an automatic reaction) afterwards, I still think I need to retell you both how much I loved it. I have thought about it many times since - the way it was written; the layers, the unspoken, the unsaid, and get a little bit more inspired every time. I also appreciated the leaflet telling us of the way it was written, the throwing out of ideas, the possibilities, the pathways. I have lived all over the world, in fact two of my grandchildren are half Australian Aboriginal so their stories sometimes come into my writing, as do those of Cambodia as three of the others are half Cambodian and with a husband who is part Native American I guess I have no excuse not to delve into this rich pool of heritage. You were so inspirational. Enough to open up a whole new way of approaching the way I write, the many places I have lived, the people I met along the way, the stories I gathered on the journey. Thank you, I hope we meet again." "Amazing - truly entertained on so many levels - drama like this only comes once in a while - too good to miss!" "I saw this play last Friday in Epworth. It was superbly performed. It was totally engrossing and I found the many layers of communication both interesting and intriguing. My husband and I like to support local theatre and recently a couple of am dram productions for a variety of reasons had been very disappointing. So to attend live theatre performed by professional actors like yourselves was a particular treat. My husband's sister is a professional story teller and has me completely wrapt in her performances. The mental connection/comparison I made between story telling and your play also fascinated me both in their differences and similarities. After a very colourful life which included studying Semitic languages and literatures at Leeds Uni I was also interested in the background of the play. It seemed to me that a lot of research had gone into the writing and I was also very impressed by the accuracy of the material. It was truly excellent and I do hope to have another opportunity to see more of your work. In the meantime may I wish you both every success in the future. Thank you for a wonderful evening." "I saw this play in Epworth. It was very well researched, superbly written and excellently acted. It's multifaceted performance continued to echo in my thoughts for days afterwards. It was very moving and the act of paring down the play to basics allowed one to concentrate more readily on the essence of this fabulous play. A real must see piece of work!" "Extremely moving - just proved words can have a profound effect." "To your everlasting credit you have thrown a very large cat among the twittering canaries and the fluttering and screeching is still going on!! and as for me the intriguing issues you have re-awakened will marinade in my mind and soul for as long as the cat and the canaries escape their trapped destinies." A man and a woman try to mend their broken past. In a garden full of birdsong she tells him stories. But time is running out for this man and he has a tale he needs her to help him tell before the day is done. In this exquisitely structured drama the characters gently hold your hand and lead you on a journey that takes in ancient history, neuro-science and the power of language. But all journeys come to an end and when this one does it breaks your heart. Intimate and intricate this five star production crackles with wit and wisdom.